Mowers Direct and Toro have teamed up to offer you special financing and promotional offers through Citi. Purchasing Toro products couldn't be easier! Simply follow the steps below and be on your way to financing your equipment in seconds. The next time you go to mow the lawn, you'll have to keep from smiling! A Toro-branded credit card from Citi allows you to buy the Toro power equipment you need with flexible payment options. Several special financing offers are available, the minimum purchase amount to take advantage of financing offers from Toro is currently $500.00. Already have a Toro Credit Card? If you already have a Toro credit card from Citi, you can complete your order from the check out by selecting "Toro Financing with Citi" as a payment option. Simply choose "Manage Your Account" and follow the steps to complete your order. Need to Apply for a Toro Credit Card? 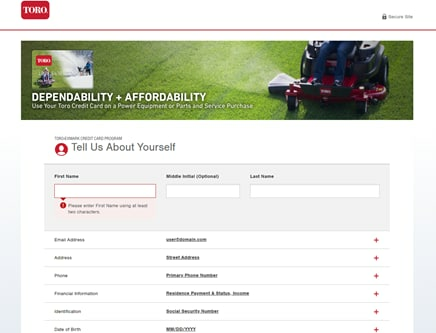 Toro financing will only appear if your cart qualifies. You can purchase several pieces of equipment at once, as long as your cart is made up of 90% of Toro products. A Major Purchase Plan fee may be applied to certain financing purchase plans. 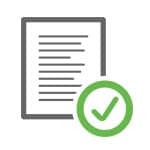 Once approved, you'll be on your way to financing your equipment in seconds. You must be approved for the full purchase amount at checkout, no split payments. If for any reason you are not approved, Citi will be able to provide the reason to you via mail or phone. We will not be provided that information, you must speak with Citi directly. It is very important that you write down your new Toro Credit Card account number, as we nor Citi will not have access to it after it is generated. If you are using a mobile device, simply highlight the number and copy it to your clipboard. You can then open a new window to paste it in the check out screen. Simply complete the payment information by entering your credentials and check the "CVV not available" box. There are several financing plans available at a given time. You can see the list of current offers below. On purchases of $500 or more. Interest will be charged to your account from the purchase date if the purchase balance is not paid in full within 12 months. Receive up to a $50 Visa Prepaid Card by mail-in or online rebate. Learn More or click here for details. *With credit approval for qualifying purchases made on the Toro Credit Card at participating dealers. As of December 26, 2018, Purchase APR: Variable 25.99%. Minimum interest charge $2.00. See card agreement for details. Offer valid for accounts in good standing; is subject to change without notice; see dealer for details. May not be combined with any other credit promotion offer. Purchase requirement before taxes, fees, and other discounts and must be made in a single transaction. On purchases of $1000 or more. Interest will be charged to your account from the purchase date if the purchase balance is not paid in full within 12 months. Receive up to a $100 Visa+ Prepaid Card by mail-in or online rebate. Learn More or click here for details. On purchases of $500 or more when you use the Toro Credit Card. *With credit approval for qualifying purchases made on Toro Credit Card at participating dealers. 0% APR until balance is paid in full. The amount of the 18 monthly payments will be equal to the total purchase amount (including taxes) divided by 18, rounded up to the nearest dollar. If you have other balances or late payments on your account, the number of monthly payments advertised may not pay off the balance. See card agreement for details. Offer valid for accounts in good standing; see dealer for details. May not be combined with any other credit promotion offer. On purchases of $1500 or more when you use the Toro Credit Card. 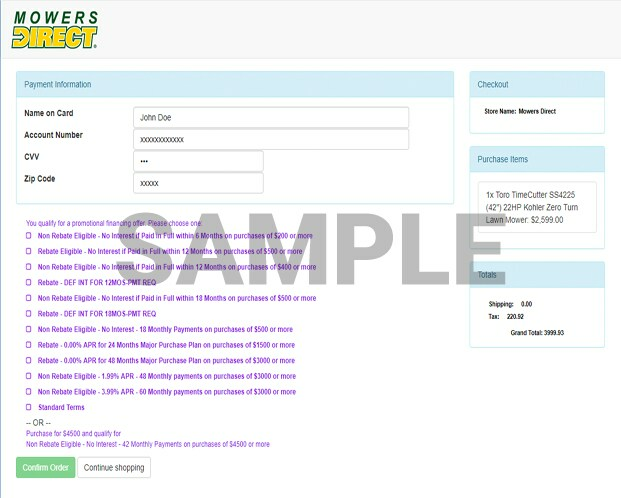 A Major Purchase Plan fee of $49 will be added to the Major Purchase Plan Purchase amount. *With credit approval for qualifying purchases made on Toro Credit Card at participating dealers. 0% APR until balance is paid in full. The amount of the 24 monthly payments will be equal to the total purchase amount (including taxes) plus the Major Purchase Plan Fee divided by 24, rounded up to the nearest dollar. If you have other balances or late payments on your account, the number of monthly payments advertised may not pay off the balance. See card agreement for details. Offer valid for accounts in good standing; see dealer for details. May not be combined with any other credit promotion offer. On purchases of $3000 or more when you use the Toro Credit Card. A Major Purchase Plan fee of $49 will be added to the Major Purchase Plan Purchase amount. *With credit approval for qualifying purchases made on Toro Credit Card at participating dealers. 0% APR until balance is paid in full. The amount of the 36 monthly payments will be equal to the total purchase amount (including taxes) plus the Major Purchase Plan Fee divided by 24, rounded up to the nearest dollar. If you have other balances or late payments on your account, the number of monthly payments advertised may not pay off the balance. See card agreement for details. Offer valid for accounts in good standing; see dealer for details. May not be combined with any other credit promotion offer. On purchases of $3,000 or more when you use the Toro Credit Card. A Major Purchase Plan fee of $149 will be added to the Major Purchase Plan purchase amount. *With credit approval for qualifying purchases made on Toro Credit Card at participating dealers. 0% APR until balance is paid in full. The amount of the 42 monthly payments will be equal to the total purchase amount (including taxes) plus the Major Purchase Plan fee divided by 42, rounded up to the nearest dollar. If you have other balances or late payments on your account, the number of monthly payments advertised may not pay off the balance. See card agreement for details. Offer valid for accounts in good standing; see dealer for details. May not be combined with any other credit promotion offer. *With credit approval for qualifying purchases made on Toro Credit Card at participating dealers. 0% APR until balance is paid in full. The amount of the 48 monthly payments will be equal to the total purchase amount (including taxes) plus the Major Purchase Plan fee divided by 48, rounded up to the nearest dollar. If you have other balances or late payments on your account, the number of monthly payments advertised may not pay off the balance. See card agreement for details. Offer valid for accounts in good standing; see dealer for details. May not be combined with any other credit promotion offer. *With credit approval for qualifying purchases made on Toro Credit Card at participating dealers. 1.99% APR until balance is paid in full within the promotional period. If you have other balances or late payments on your account, the number of monthly payments advertised may not pay off the balance. See card agreement for details. Offer valid for accounts in good standing; see dealer for details. May not be combined with any other credit promotion offer. *With credit approval for qualifying purchases made on Toro Credit Card at participating dealers. 3.99% APR until balance is paid in full within the promotional period. If you have other balances or late payments on your account, the number of monthly payments advertised may not pay off the balance. See card agreement for details. Offer valid for accounts in good standing; see dealer for details. May not be combined with any other credit promotion offer. Get Special Financing on Toro Lawn Mowers - View Our Toro Lawn Mower Financing and Promotions. Our lawn mower how-to library can help you pick the perfect reel lawn mower, push lawn mower, riding lawn mower, zero turn lawn mower, lawn tool or lawn mower accessory.